During their training, the young students have learnt to brand and vaccinate cattle. Linda Zwane, a livestock farmer in Mpumalanga, made it his business to introduce 120 young, black women to livestock husbandry on his farm, as well as mentor those that requested his guidance. His confidence in the opportunities for black women in agriculture is now reaping extraordinary rewards. After spending time on Linda’s farm, 40 of the 120 women expressed keen interest in farming. Of these 40, 28 were granted scholarships from Monsanto through Khulisa Social Solutions to study at the Buhle Farmers’ Academy. The Humulani Trust paid the considerable extra transport costs necessary for the livestock students’ practical training. According to Linda, these young women are now primed for success. Under Linda’s guidance, these 28 women have formed a co-operative and applied to the Department of Rural Development and Land Reform for a farm. The department is currently considering the application. Linda Zwane with his Star of Buhle award. Linda will continue to mentor the group once they have acquired a farm. The aim is to obtain enough land for them to divide the farm into four components, and work in four groups of seven. The first group will concentrate on the beef cattle and goat components of the operation, while the second group will focus on sheep and dairy cows. The third will focus on the piggery, and the fourth on vegetable production. “Even now, I have spoken to farmers around me and told them that if they want help with branding or vaccinating their cattle, I will bring these young ladies, and they will do it,” says Linda. 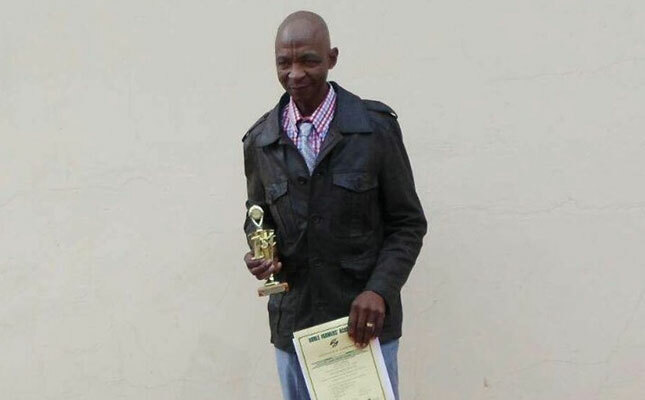 Linda was the top achiever of his Buhle Academy livestock class when he graduated in 2013. This year, he was nominated for the Star of Buhle, which was awarded at the June 2017 graduation ceremony at the Buhle campus in Piet Retief, for successfully building a farming business. Coincidently, his mentees were graduating on the same day. He has also since received an achievement award from the mayor of the Majuba district where he farms. The young women went to Buhle after taking part in a year-long Global Give Back Circle programme run by Khulisa Social Solutions. This is an education and empowerment programme in which they gain life and financial skills, computer literacy and other skills, and are mentored over time. The idea is to empower students to embrace the programme’s “give-back” philosophy. A friend of Linda’s wife put him in touch with Tine Cornellie, of Khulisa. After speaking with Tine, he offered to take the young women to his farm in groups, to assess their interest. “I thought at the time that even if I was only left with seven, I would be happy,’” he says. Once at Buhle, 21 of the young women studied livestock production, and seven studied vegetable production. “Only one dropped out of her course at Buhle. The rest did very well,” Linda said. The women, once a little afraid of hooves and horns, are now unbeatable in the kraal. The students formed such a strong bond with their livestock trainer at Buhle, Gert Steenkamp, who also trained Linda, that they refused to graduate until he arrived at the ceremony. They even composed a song about him, which they sang in a jubilant dance. “The youngsters whom I train don’t usually leap in boots and all. But really, I was surprised by these girls,” said Mr Steenkamp, who speaks three African languages and communicated with the young women in their home language, Zulu. Nelly Shezi, 25, one of the students said: “My life was an utter disaster just over a year ago. I have two children and was the breadwinner in my family, but I had been retrenched from my job as an electrical technician. It was difficult, very difficult. Now I am excited. Life is much brighter, and it’s getting better and better all the time. “The co-operative is very good, because we work as a team. We bring up ideas, show each other things, and nobody is wrong. I wish that other young ladies could see that agriculture is good; it is perfect. It can change our lives. It can change the economy.